When planting a new border you need to choose a variety of plants that will add colour and interest at different times of the year. The best time to plant a border is in the autumn or spring when the soil is warm and moist. This provides the best conditions for rooting. One plant of each type is fine, but think about how your want the colours to blend and integrate. Use 3 or 5 of the same plant together to plant in a ‘cluster’. You need a balance of shrubs, evergreens, perennials and grasses to get a good effect. Think about what flowers when. Fill in gaps with annual bedding plants, flower seeds and bulbs. Decide on the area that your new border will occupy. It needs to have at least some sunshine during the day. Dig over the whole area, digging out any weeds. Pay particular attention to any perennial weeds that may persist in the soil. Remove all the roots as deep as possible to prevent them from re-growing. Check the pH level of the soil to find out what conditions your plants will have to tolerate. Ideally it needs to be just slightly acidic (anything from pH 6.5 to 7.5). It’s important to ensure the soil has good structure and is healthy. 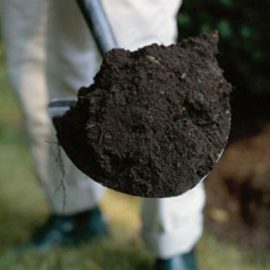 The best way to do this is to feed the soil with plenty of well-rotted organic matter. Improve the soil by incorporating a generous amount of Westland Soil Conditioner to enhance the structure and improve its moisture retaining and nutrient properties. Plan out what plants should go where. You can do this by arranging the plants in pots on the soil and moving them around until you are happy with the look of them. Look at how big they will grow and position the taller shrubs towards the back of the border with the lower perennials towards the front. Use the evergreens around the whole area to create structure over the winter when the border will be bare. Once you have got the plants in the right positions you can start to plant them. For each one you need to dig a hole for each plant, at least twice the size the depth of the root ball of the tree, shrub, grass or perennial that you are planting. This will provide a generous rooting zone for the roots of your new plant to grow into. Loosen the base of the hole and mix in a generous amount of Gro-Sure Rose, Tree and Shrub Compost. Remove your plant from its pot and tease out the roots so that they grow into the surrounding soil more easily. 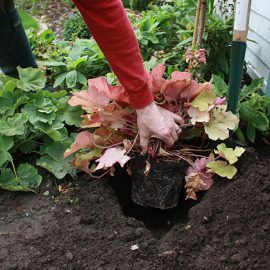 Place the root ball into the planting hole, making sure that the top of the roots is level with the top of the border soil. Fill in around the root ball with a mix of garden soil and Gro-Sure Rose, Tree & Shrub Compost. Firm in gently using your feet. Water well and then mulch over the whole area with a generous layer of Westland Decorative Mini Bark to help retain moisture.